Merchandise Outlet actually started out as Central Michigan Surplus in Shepherd in 1984. Within 1 year, Doug and Keith purchased a corner lot in Mt. Pleasant on the corner of High Street and Bradley Street. They then incorporated a company called Merchandise Outlet. This became our first location of Merchandise Outlet, or more affectionately known as MO or the Merch. Walk into Merchandise Outlet - it is like visiting an old friend. Our Mt Pleasant store is the oddest physical location. The store was once a boat dealership. It was once three retail stores in the same building. Since then, we have knocked down walls, and most recently knocked out windows - revamped, repainted, etc. to become the store that we are now. The low ceilings, block walls, old floor tiles and vintage style environment create a warm, familiar feel like visiting an old friend. Our Mt. Pleasant location has notoriously been our most transient staff. This is mostly due to being in a college town and having a majority of staff having some relation with either CMU or MMCC. No matter what, we have been blessed to have friendly, vivacious, hard-working people working in our Mt. Pleasant community. I'm sure that many of you have those who currently know or remember fondly. Sarah is the store manager in Mt. Pleasant, She came to Merchandise Outlet with 30 plus years of retail experience. "This is an entirely different retail than any other. The constant changing of merchandise from day to day is fun and challenging." Sarah enjoys her repeat customers that she has the privilege to know, joke with, and have fun with. "They are like extended family." The team at MtPleasant are like family. Although the customers may not appreciate the store hours; 9am - 7pm Monday through Saturday and 10am - 5pm on Sunday; the employees enjoy that they still have time for family and "maybe even a motorcycle ride after work in the summer"
Tori has been with Merchandise Outlet for about 2 years. You will find her most of the time in the back room having a ball going through all of the new, exciting merchandise. Tori brings a smile to the team every day. One of her favorite things about Merchandise Outlet is being small enough to get to know the customers on a personal level. "I have a customer who comes in all the time. Her husband took a job in North Carolina and they are moving. Leaving Merchandise Outlet was a "con" in her pro/con list for leaving. She asked if she could add me on Facebook because she was going to miss me. Isn't that so cool?!" Meagan started out as a cashier at Mt Pleasant about a year ago. She has made her way into the back room to be a key player in receiving most days. She loves that Merchandise Outlet is all about getting new stuff and just being a new day everyday. "It is so cool working with the general public and meeting new people everyday." Victoria started with Merchandise Outlet about a year and a half ago. 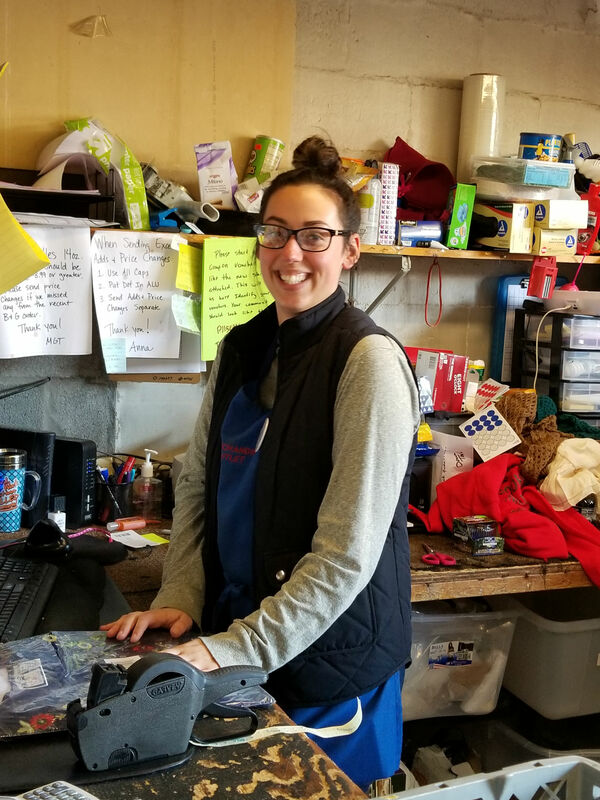 One of the things that Victoria likes about working at Merchandise Outlet is that she is able to do a lot of different tasks; stocking shelves, running the cash register, receiving merchandise, but mostly helping customers with their needs in the store. Becky has been with us for almost a year. Becky excels at displaying all the new merchandise in the store. The best thing about it is seeing all the new merchandise as soon as it gets in. " We get so many interesting things in that other retailers don't get." She also likes still being in retail so she can see a lot of the customers from where she worked before. And this beautiful smile is Morgan. Morgan has spent her last high school year working with us at Merchandise Outlet. If you have been a regular customer, you have seen Morgan grow from that quiet new employee to a vibrant retail attendant. She has enjoyed learning to work with the customers and help them with their needs. She has enjoyed that Merchandise Outlet has accommodated her hours studying at MP High School and MMCC. Does that look like a shy smile? This is Karyonda. She has been with us for almost a year, getting her feet wet in the work force. She, also, is a MP High student who is, hopefully, planning on attending MMCC and sticking around with us for a while. She has come a long ways and learned a lot about retail. That is saying a lot, since Merchandise Outlet is like no other retail. Meet our friend Jennie. Jennie has been with Merchandise Outlet for close to a year now. She loves that Merchandise Outlet has such great prices and new merchandise all the time - this makes it so easy to have such a great time with customers. Not only with the customers, but Jennie loves that she is part of a team that are strong and supportive as well as goofy and fun. "It is such a great work environment. This is hands'-down the best work family I have ever had." Katelyn has been with Merchandise Outlet for about 6 months. She brings such vitality and energy to the Mt. Pleasant team. She loves seeing the new merchandise coming in every day. What she loves most, though, is having such loyal regular customers coming in all the time and the opportunity to build relationships with them - and the excitement of having new customers "find" Merchandise Outlet. Katelyn loves being part of an outgoing and crazy (but a good crazy) team who just make everyday at work something to look forward to. This is our team at our Mt Pleasant store today. I have to say that it is probably one of the best combination of members that we have had. Every member is proud to make Merchandise Outlet the best that it can be. An overall agreement in everyone is that working with the customers and getting to know them is one of the highlights of the job. Of course, another highlight is just being at Merchandise Outlet every day! Stop in and say hi!